Saturday 5th September 2015 - Westburn Park, Aberdeen. 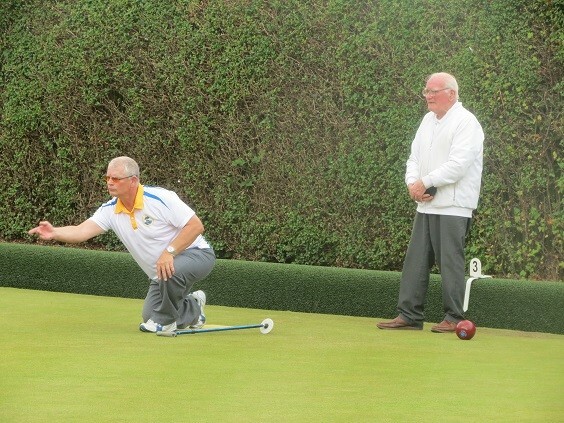 After last year's successful annual event held at Longniddry Bowling Club, Lothian Disability Sport were delighted to be welcomed back to the club this year - with the weather also being a little kinder than this time last year. Carole Martin (Longniddry) claimed victory in the combined section (1 and 5) for the second year in succession - however, she was pushed very close in her first match of the day by a re-invigorated Bob Sinclair (Longniddry). The tie had to be decided by an extra end, which Carole claimed and won 6-5 overall. This spurred Carole on as she went on to record a convincing match against Campbell Ridge (Kirkliston) and claim first place in the section. Results were also mirrored from last year's Ambulant Bowlers (and B3) section as Robert Kelly (Prestonpans) continued his undefeated record at Longniddry, claiming the top prize. However this victory needed to be decided on points difference as Robert, Gary Clelland (Bellsburn) and Robert Harvey (Independant) all claimed one victory each to make for an extremely competitive group. Players will now qualify to represent the region at the Scottish Disability Sport National Lawn Bowls Championships on Saturday 5th September at Westburn Park, Aberdeen. We wish all the Lothian players all the very best. Longniddry Bowling Club provided an excellent venue again this year with the green in excellent condition and the hospitality second to none. The club operate entirely inclusively and offer opportunities to players with a disability - hosting two Bradshaw Buggies and providing players with a physical disability complete access to the green. Bathgate Academy will play host to the first disability table tennis event on Wednesday 20th May, open to all school aged young people from the Lothian region with a physical, learning or sensory impairment. Table Tennis was included in the Paralympic Games in London and Scotland possess a player with enormous potential in the sport - Martin Perry. 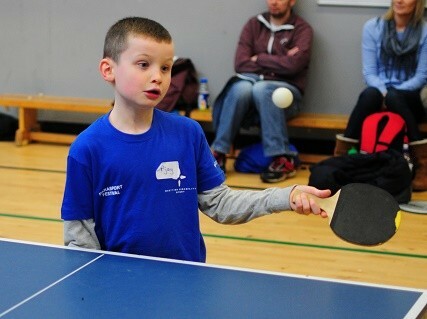 The event was included in the Lothian Disability Sport school calendar of events for the first time this year and will be delivered as a partnership event by West Lothian and Murrayfield Table Tennis Clubs, while be supported by West Lothian Active Schools. 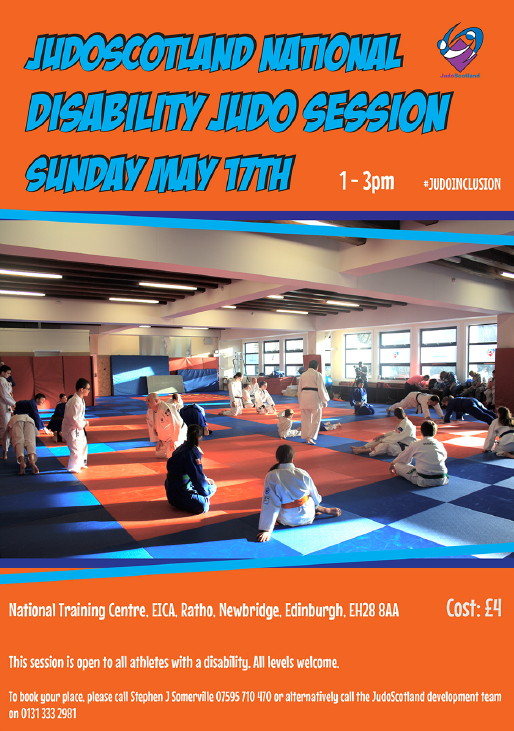 JudoScotland will be holding the next National Judo ‘Come Together’ session at Ratho on Sunday 17th May 2015 and invite interested players and coaches interested to come along and try judo. This session is open to all athletes with a disability and all levels are welcome. Cost £4. Para-sport Stars - Club for young people with a physical disability. Friday saw the first session of the Para-sport Stars programme at Forrester/St Augustine's Community Sports HUB, giving the young people in attendance the opportunity to try badminton and athletics. The two hour session was led by local club coaches with extensive experience in disability sport, with the young people playing badminton for the first hour before breaking to resume with a second hour of athletics. The Para-sport Stars programme is open to school aged young people with a physical disability, aiming to provide a taste in a range of sports before signposting them to clubs in sports they have particularly enjoyed. The programme will also include sessions in wheelchair basketball, judo and fencing. These session are completely free for young people and run from 2pm - 4pm every Friday until 19th June. Although the programme is based in Edinburgh, we would certainly welcome young people from additional local authorities across the Lothian region. 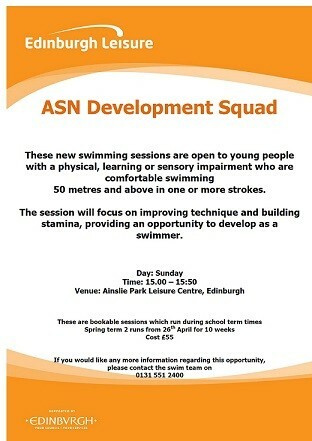 Interested in developing your swimming? You may be interested in this new swimming opportunity for school aged young people with a physical, learning or sensory impairment. The opportunity is being delivered by the swim team at Edinburgh Leisure and is targeting young swimmers who are looking to develop their stroke, strength and stamina in the pool. Swimmers should be comfortable swimming 50m and above in one or more strokes. Venue: Ainslie Park Leisure Centre, Edinburgh. To book or receive more information surrounding this opportunity, please contact the swim team on 0131 551 2400. Saturday 18th April - Grangemouth Sports Complex, Grangemouth. 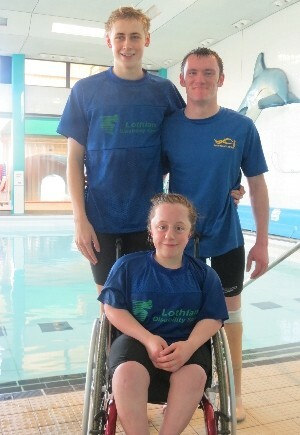 Lothian entered a small team of three to this year's Senior Swim Championships for individuals with a physical disability or sensory impairment. Due to a variety of reasons, the Branch were only able to enter three swimmers to compete for the team trophy at Grangemouth and found significant success throughout the afternoon with Laura Pilkington, Robert Dalgleish and Stephen Clegg compensating for the lack of numbers with some quality performances. 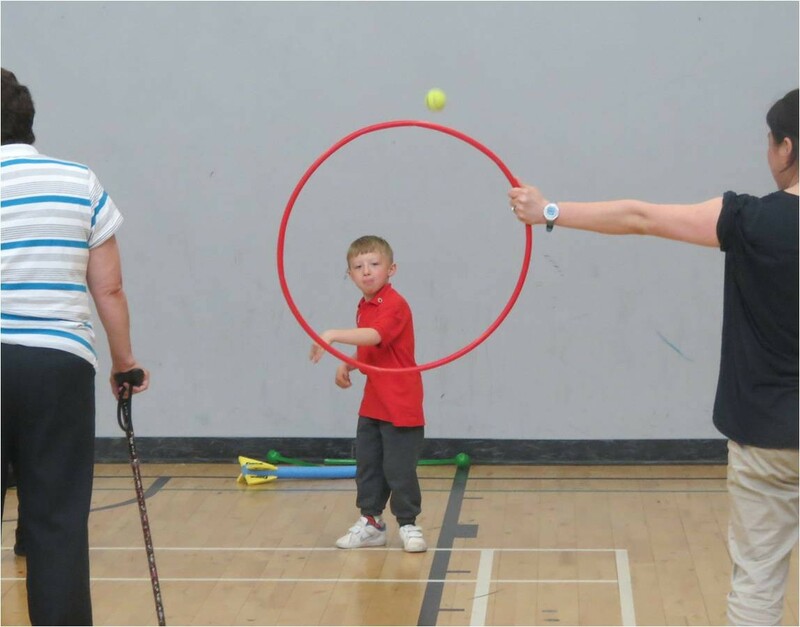 The fourth Edinburgh Paralympic Experience Event took place at Forrester / St Augustine’s High School in Edinburgh on Friday 13 March 2015 and it proved to be the largest to date, with 61 young people with a physical or sensory disability registering to participate. The event is delivered through a unique partnership approach between Edinburgh Active Schools, Scottish Disability Sport and Lothian Disability Sport and this year, Edinburgh Leisure provided valuable support to the swimming element of the event. ParaSports Stars - a sports club for athletes with a physical disability. Lothian Disability Sport are working in partnership with Edinburgh Leisure, Edinburgh Active Schools and Scottish Disability Sport to offer an exciting opportunity for school aged young people with a physical disability from the Edinburgh and the Lothian region. 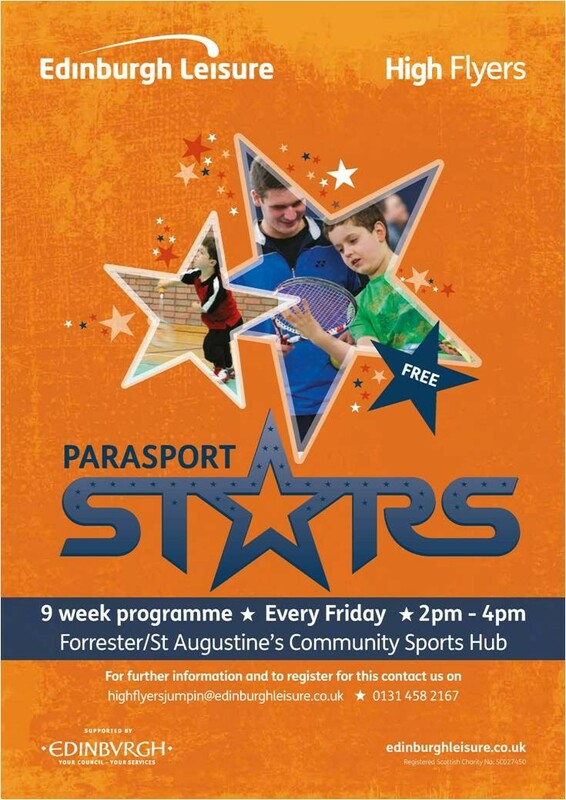 These sessions will begin on Friday 24th April at Forresters/St Augistine's Community Sports HUB, Edinburgh (2.00pm - 4.00pm) and run every Friday until the end of the school term - a 9 week programme. During the 9 week programme, Athletics, Badminton, Wheelchair Basketball, Judo and Fencing will be delivered from a number of experienced coaches. 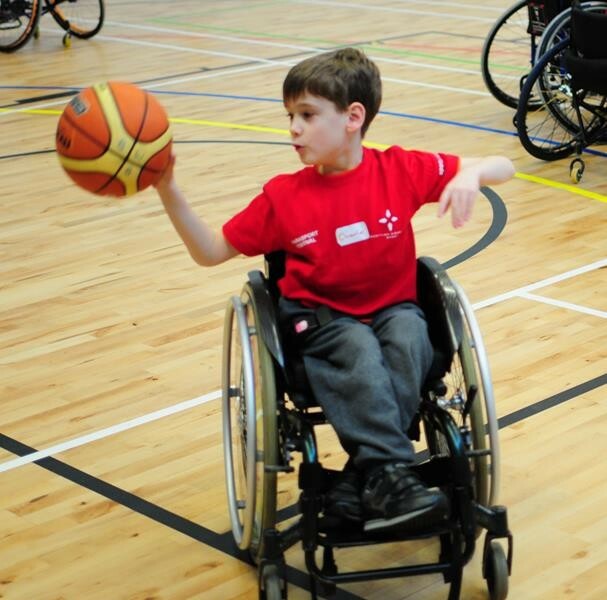 The Edinburgh Paralympic Experience Event is back and it promises to be better than ever! The annual event which will take place at Forrester / St Augustine’s High School in Edinburgh on Friday 13 March 2015 will see the young people with a physical or sensory disability descend on the capital for a day of sport delivered by some of the best coaches and clubs in the country. Making its debut will be the sport of swimming and all attendees will be encouraged to take part, regardless of swimming ability. All levels will be catered for and each attendee will have the opportunity to access the sport further. Swimming is one of the leading para sports for people with a disability and there is an extensive and established pathway available within the East of Scotland. The other sports confirmed for the day include athletics, badminton, judo, table tennis and wheelchair basketball. These sports have been selected due to the strong club links locally, so that young people can continue to enjoy and develop within the sports for many years to come. There will also be a high performance para athletes’ panel, allowing for an engaging question and answer session and we will see the return of the ‘How to Identify and Include Children and Young People with a Disability in Sport’ workshop, delivered by Richard Brickley MBE. As in previous years there will be an opportunity for parents to attend on the day, talk to the experts and meet the clubs and this has proven extremely successful in raising the awareness and sharing ideas to enable continued participation. Parental feedback from the 2014 event include….. The event invites all primary and secondary pupils with a physical or sensory disability from the five local authority areas within the region, including, City of Edinburgh, East Lothian, Midlothian, West Lothian and the Scottish Borders.